Commodities Intelligence Centre (CIC) has announced the launch of Singapore’s first physical commodity B2B e-trading platform, together with its key industry partners Zall Smartcom (Zall, a major B2B player in China), GeTS (Global eTrade Services) Asia Pte Ltd., a subsidiary of CrimsonLogic (the leading provider of eGovernment products and services, based in Singapore), and Singapore Exchange Limited (SGX). CIC is a one-stop global trading platform built on blockchain technology, that will provide commodity traders around the world access to a range of services from transaction matching, one-click customs clearance, to supply chain financing and payment term options, as well as greater pooling of resources for both buyers and sellers. CIC trades in an extensive portfolio of products for which it has long-term and short-term business targets, including Oil & Petroleum, Chemical & Plastic, as well as Ferrous & Non- Ferrous Metals, and Agriculture Products. Since its trial operation in July, CIC has nearly reached a turnover of US$200 million – covering markets including China, Switzerland, Australia, India, Malaysia, and other countries within Asia – which includes successfully completing a Chinese silk reel transaction to India, as well as the import of a batch of UAE PVP materials into China. Powered by Blockchain, the CIC platform boasts of enhanced security across trade related documents, from Certificates of Origin, to Commercial Invoices. This enhances the transparency and trust between shippers, freight-forwarders and users, while providing a strategic edge to businesses trading on the platform. Speaking at the CIC platform launch event, Enterprise Singapore’s Assistant Chief Executive Officer, Mr Satvinder Singh added, “Commodity Trading remains a critical growth pillar for Singapore’s economy having generated US$1.2 trillion in turnover in 2017, driven by a sustained global economy and demand from Asia. “The presence of digital B2B platforms like CIC in Singapore, along with Singapore’s excellent connectivity, supply chain and financing ecosystem, will strengthen Singapore’s position as a global trading hub,” he continued. “CIC is going to be a game-changing platform for Singapore’s commodity trading community. As a shareholder and technology partner of CIC, GeTS and its CALISTATM platform orchestrates the key physical and non-physical – such as regulatory and financial – logistics activities on a digital eco-system, making commodity trading easier, accessible, and predictable,” said Mr. Eugene Wong, Chairman of CrimsonLogic and GeTS. “Importantly, CIC can revolutionise commodity trading by attracting more buyers and sellers globally to come on board, with the potential to lower and even stabilise the cost of commodities,” he said. As part of its launch ceremony, CIC also announced the signing of a Memorandum of Understanding (MOU) with Marubeni Corporation, a leading Japanese integrated trading and investment business conglomerate, to unlock commodities trade opportunities for Supply Chain Finance. Supported by Zall, GeTS and SGX in Singapore, the MOU signing was witnessed by Iwasa San, Managing Director of Marubeni ASEAN, and Ms. Sharon Chou, Chief Financial Officer of CIC at the official launch of the CIC platform. Marubeni’s interest to collaborate with Zall Smartcom comes off the back of the company’s plans to provide comprehensive trade financing capabilities to international SMEs through more finance channels. 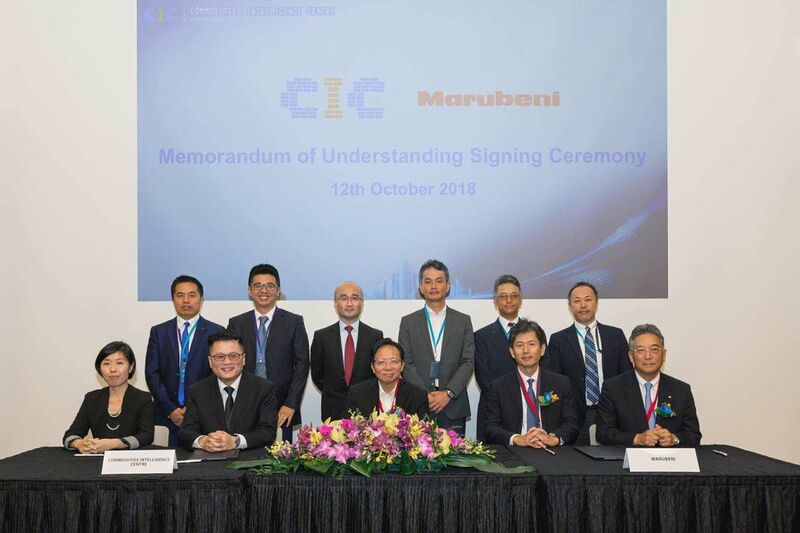 The MOU sees Marubeni integrating the CIC to facilitate more payment term options to bridge buyers and sellers globally with greater ease and efficiency. The CIC platform will also help the business to streamline global trade by matching buyers and sellers of commodities, while also providing supply chain financing, faster clearance, and logistics services.